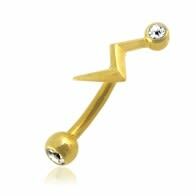 Take a look at the gold body piercing jewelry collection, where, our solid 14 karat wholesale gold curved barbells fashioned in nickel free will definitely thrill you. We possess an outstanding line of high end gold eyebrow rings that will give your piercing a great demeanor and stimulate your style. We have innovative curved barbells done in both yellow and white gold.